This Grapes of Venice tapestry shows the work of artist Bianchi. 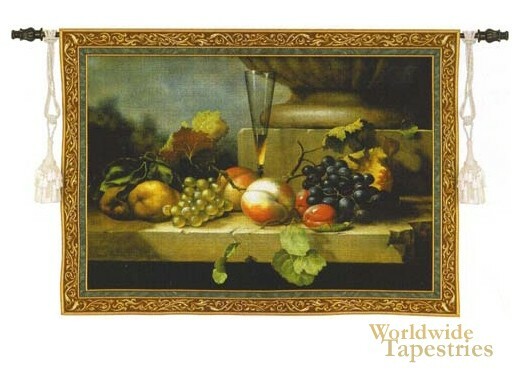 The realistic style of Bianchi is seen here in this work where the arrangement of fruit on a stone table cast with a lovely light presents a beautiful scene. Apples, pears and grapes are seen on a classic cracked table with an urn behind to symbolise grandeur and a tribute to the classic still ifs of ancient Greece and Rome as well as the Renaissance, yet in a style all his own. A champagne flute shows this work as a modern rendition of a beautiful subject. This Grapes of Venice tapestry is backed with lining and tunnel for easy hanging. Note: tapestry rod and tassels, where pictured, are not included in the price. Dimensions: W 76" x H 53"